Another free utility, which I now use all the time, is Google Calendar. There are many calendar programs around, but this one is well designed, easy to use and has great calendar sharing facilities. Getting the calendar is straightforward. Go to the Google home page and at the top left there are some menu items which appear after a few seconds. The rightmost of these is ‘more’, and under there is ‘Calendar’. Click there, follow the prompts and create an account. You need to be online to update your calendar but you can download an offline copy if you want to take a read-only copy somewhere. First the calendar itself. It has all the usual features you would expect , but there are two which I find particularly useful. 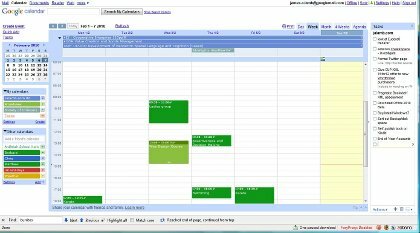 First, in addition to events which start and end at specific times, you can create events which span whole days and which are shown on the calendar by a solid bar spanning those days. This, I find, particularly helpful for planning indexing jobs. Deciding how busy I am scheduled to be at any time and whether I can accept a new commission. Second, is the alarm system. You can attach alarms to any item, so that you can get a pop-up reminder or an email sent to you, minutes hours or days before it starts. This is really helpful for such things as remembering to chase clients regarding proofs which are supposed to arrive on a particular day, or an invoice which should be paid by a particular date. The email reminder works without you having to go to the calendar and is excellent for long term things like birthdays and tax returns. What sets Google Calendar apart is its calendar sharing facilities. In addition to my business calendar, I also keep a calendar of everything which affects my house. That calendar is shared with my wife, so we can both see it and update it. She also lets me see her personal calendar (and actually it is quite important for domestic harmony for me to know whether she has just returned from the hairdressers or from having surgery on her teeth!) My son, who lives 10 miles away, lets us see his calendar on which he records which days he is working, so we can plan when we might see him (and ensure that we have enough food in on those days!). I am sure there are applications within the Society for things like local groups, but for anyone whose time interacts with anyone else’s in any way, it is really very useful.